Driver identification (ITGgprs-10). ECGmobile. Electronic ski pass system. ActAmobile. Building access control ITGsr-31. Upgraded RFID terminal. External antenna (reader) ITGant-9. Alert system. ActA Web. UPS monitoring device. Innovation in the field of mobile phone content distribution. Industrial cabinet access control. Vehicles scale control system ACTAV™. Medical tubes marking and identification system. Fixed asset inventory. Fuel dispenser control system ITGfdc-1. Software package ACTA™. Desktop ID card reader ITGpc-05. Access control & Time Attendance Terminal ITGsr-06. Tripod turnstiles ITGbtt-0X. External antenna ITGant-6 for Terminal ITGsr-05. System for ticket selling and access control Actis. ITGgprs-10 RFID reader is peripheral of a GPRS tracking device. Intended for driver identification. UID of driver’s identity card is sent to central server, via GPRS tracker. We offer functionality extension of our Access Control and Time Attendance system ActA (ActAmobile). 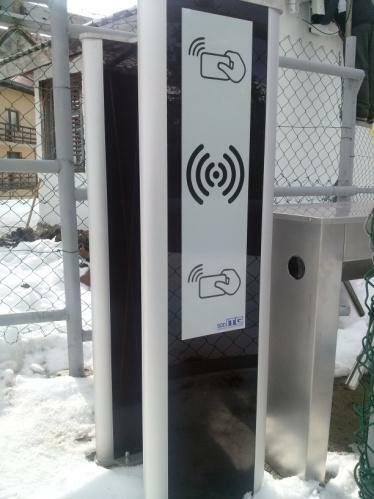 We offer RFID reader which allows enables more comfortable building access using RFID transponder (card or a key fob) as a key (BusPlus card compatible). For more information download a brochure. A new RFID reader is in offer, with functional keyboard on touch screen TFT display. The screen size is 10.9cm (4.3”). Customisable to users needs. RFID functionality is identical to other readers. For more information download our brochure.